Save 75% off LogFusion Pro in January! Help ring in the New Year by saving 75% off LogFusion Pro during the month of January! With these savings, you can purchase a LogFusion Pro license for only $5, or a Site License for only $50. For more information please visit the LogFusion Pro Purchase page. Do you need to monitor log files from a server process, or watch debug output from an application? Do you need a program that can do this quickly, with powerful features that make it easier? I'd like to introduce you to LogFusion! LogFusion is a powerful log monitoring tool that makes parsing your logs easy. Take advantage of LogFusion's Row Highlighting and Text Filtering features to quickly filter your log and only show the relevant lines you are looking for. 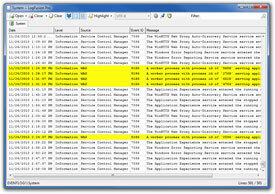 Use the Custom Columns feature to let LogFusion parse and split your logs into separate columns for easier reading. Just like the popular 'tail' program in Linux/Unix, LogFusion can also auto-scroll and always show you the newest lines in your log files in real-time. I am very happy to announce the release of LogFusion 1.1! This new version adds some highly requested features, and also fixes a few small issues. LogFusion 1.1 now has an option to show tooltips for each line. You can also customize the font used, in case you don't like "Courier New". The biggest new addition is the ability to monitor output from OutputDebugString function calls. This is invaluable for any software developers who are debugging an application and want to avoid physical log files. Some of the bug fixes include reduced UI flickering, ampersands not being displayed properly and right-clicking on selected items does not clear the selection anymore. To see a complete list of changes, please visit the LogFusion Change Log. I encourage everyone to download LogFusion 1.1 today to take advantage of these new features and fixes! LogFusion can load any text logs, including web server logs, developer debug logs and any other text that is outputted to a file. LogFusion can also read Event Logs in real-time, and can even use it's powerful Text Filtering and Row Highlighting features to help you find specific items. Head over to the LogFusion website for more information, and grab this free download today! FileSeek 2.0.4 has been released, and is ready for download! This new version changes a few small things. The "Query" field is now focused after a search is complete so you can easily type in a new query string and search again. In an effort to help you find the files you are looking for, the date filter can now be toggled between "Date Created" and "Date Modified". Previously, this only filtered on "Date Modified". I would encourage everyone using FileSeek to download the new version today to take advantage of these new features. Thanks everyone! You can download this new version from the TrayStatus Download page. Celebrate and Save 33% off DisplayFusion! What does baby Lotus think of all this? If you have been waiting for a good time to pickup some DisplayFusion licenses, now is your chance. You can buy 5 licenses at just $10.05 each, for a total of $50.25. That's only $50 for 5 licenses! This sale ends Saturday, October 9th at midnight (GMT-5) so don't delay! Update: This sale is now over. Thanks to everyone who supported DisplayFusion by purchasing a license! To see the complete list of changes, please visit the DisplayFusion Change Log. As always, I would encourage everyone to update to this new version today. If you run into any issues, please visit the DisplayFusion Support page to see all of the different support options available. Thanks everyone! I am very happy to announce the release of ClipboardFusion 2.0.4! This new release is a small bug-fix release, and doesn't add any significant new features. The first bug that was tackled was an intermittent stability issue, which should now be cleared up. The second issue was a complete re-working of all the windows in ClipboardFusion to make them friendly for people running higher DPI (font scaling) settings in Windows. ClipboardFusion now correctly scales all of it's own windows and controls. If ClipboardFusion detects that the window won't fit on the screen after being scaled it will disable scaling for that window so that none of the controls are cropped. This should help people running 125% scaling (or higher) with a resolution of 1024x768 or lower. Previously the bottom of the Settings window would be chopped off, making the window unusable. I always try to make an extra effort to make all of my applications as accessible to everyone as possible, and I'm sorry it took so long to get ClipboardFusion up to a higher standard. I would encourage everyone to update today, especially if you run higher DPI settings. Thanks everyone! DisplayFusion was first released in August of 2007, over 3 years ago! During the last 3 years, DisplayFusion has grown into a must-have utility for anyone with multiple monitors. Licensing has changed as well over the years, with the introduction of a paid Pro version nearly 2 years ago. This paid Pro version was licensed on a per-computer basis, requiring multiple licenses to be purchased for use on multiple computers. After quite a bit of feedback from the DisplayFusion community, I have decided to shuffle the licensing around a little bit. Starting today, you can now purchase a DisplayFusion Pro Personal Home license. This new license is for home users ONLY, and is not a valid license for company users. The license allows a home user to purchase 1 license, and install it on all of their computers. It's like a mini site license for home users. If you are a home user that has already purchased a DisplayFusion Pro license and you would like to upgrade to a Personal Home license at a discounted price, please contact me. Another licensing change is a new restriction on free version usage. Starting with version 3.2, the free version of DisplayFusion will no longer be allowed to be used in a company environment. If you are using the free version of DisplayFusion in a company, you have 2 options: keep using 3.1.10 without any restrictions or convince your company to purchase a DisplayFusion Pro license. A single license is just $25, and with multiple licenses you can reduce this to just $15 per license. DisplayFusion needs your support, and every DisplayFusion Pro license purchased will help! If you have any questions or comments, I encourage you to contact me. If you are using the free version of DisplayFusion, and you can't live without it, why not pitch-in and support the development of future versions? 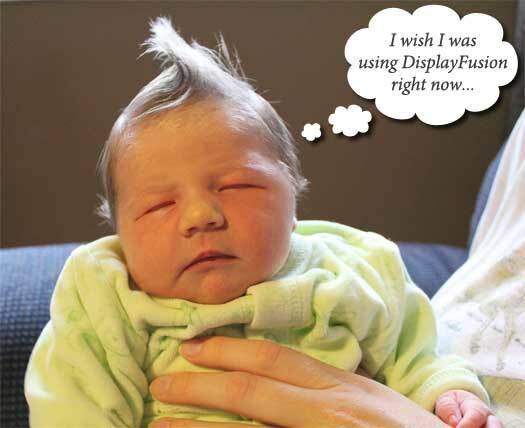 It's only $25 and your purchased license will be valid with all future versions of DisplayFusion! I am very happy to announce the release of FileSeek 2.0! This new release adds the ability to copy or delete selected files/folders in the results list, without having to use the Windows context menu. Also, you can now see the size of the files in the results list thanks to the new "File Size" column. In addition to these new features, there are a few interface fixes, and some performance enhancements behind the scenes. As always, I would encourage everyone to update to this new version today. FileSeek has also found a new home, now located at http://www.fileseek.ca! Giving FileSeek it's own website is long-overdue, and should make it easier to find out everything you need to know about FileSeek. Head over to the new website today, and be sure to download the new version while you're there!